Tried some new foods (crab legs!! ), went to Atlanta to be production assistant for a conference (and saw a Braves game! 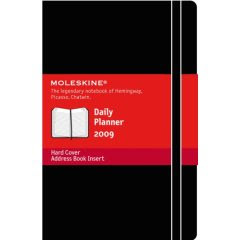 ), switched from ball-point to felt-tipped pens, got a massage at a spa, went to Dodger Stadium, joined facebook and twitter, started doing Crave announcements in the Refinery, visited Oxford and Stonehenge and Bath and Windsor, went to 3 midnight movies (ugh…why?! ), joined a Masters swim team, and took a five- and four-year-old to Disneyland for a day (with help!). I cannot help myself from making resolutions every year. I usually meet goals that I am serious about, but I make so many resolutions that I naturally don’t keep them all (or even remember them!). Generally speaking, next year, and in life, I want to reflect the character of Jesus to people, contribute to others’ lives in a positive and meaningful way, be a productive person and constant learner, always have a grateful heart, and cultivate my interests. Yes! Many did. I was so especially excited for Clayton and Allison and Derek and Lena! Yes. My grandma passed away last spring. England. And man, did I have a blast. 7) What date(s) from 2008 will remain etched upon your memory, and why? The first four months or so of the year were a bit sketchy…I had chest pains caused by anxiety, a random tear duct infection, and severe tonsillitis, all within a short amount of time. But then I felt much better. I also threw my back out and had chronic back pain in late summer, but that’s normal…don’t worry about it, guys…haha. Tea at the Ritz Hotel in London with one of my best pals, Hayley. It was so, so great. We drank so much tea and were so excited that, even though we were so tired from walking around all day, we couldn’t fall asleep until three in the morning. Anyone who sacrificed something of themselves for the benefit of someone else merits celebration in my book. Anyone who took a side in a debate/issue/argument, who didn’t have a true sense of conviction and only wanted to cause a ruckus, be part of the scene, or make a statement made me sad. A lot of it went to gasoline for most of the year…ugh! Most of it went to London, including the entirety of my economic stimulus check! I get really, really, really excited about a lot of stuff, whether it’s going on a trip or the smell of a cinnamon crunch bagel from Panera, so…I don’t know what to tell you. 15) What song will always remind you of 2008? Viva la Vida by Coldplay. My brother and I saw them in concert in November and they’re so incredible…I almost can’t handle it. Wiser? I think so. Healthier? Difficult to say. Richer? In many ways. My family went to church and dinner on Christmas Eve, came home and sat by the fire, and opened presents. I also read The Catcher in the Rye. On Christmas Day we had a great dinner and then I saw “The Curious Case of Benjamin Button” with friends. 20) Did you fall in love in 2008? If fictional characters count, then yes. LOST. 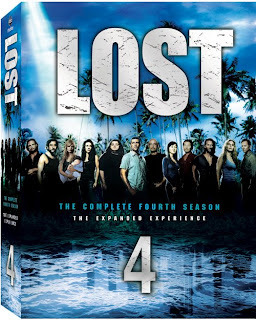 Oh, LOST…I love it. I don’t think I hate anyone…so, no. Hands down it was The Road. Country music. It’s true. I would say that I learned to love it in 2008. A few things…no matter, though. To celebrate turning 26, my small group took me to dinner on my birthday eve, and the waitress gave my birthday dessert, with the candle and everything, to the wrong person; it was hilarious. And I spent my actual birthday at Disneyland with Amberpants, eating ratatouille and pink ice cream, and I got so many texts and messages and it was great. I felt so loved and special and I laughed a lot. That, to me, is a great birthday. Joel McHale and Tony Bourdain. 30) How would you describe your personal fashion concept in 2008? I miss my relatives in Germany, Mic, Elizabeth, Amber Rusher, the Coates family, Mindi, Jared, Jeananne, and Adam in Australia! 33) Tell us a valuable life lesson you learned in 2008. Well, I learned that I shouldn’t be content with mediocrity; I want to strive for excellence. Some close friends—not to death, but to distance and busyness. Moving offices allowed me to meet many new people this year…and I am so grateful for my new friends. Monday 12:00 noon - 6:00 p.m.
Wednesday 12:00 noon - 6:00 p.m.
Thursday 12:00 noon - 6:00 p.m.
Friday 12:00 noon - 9:00 p.m.
Good thing I checked the website last night before heading up to Pasadena this morning. 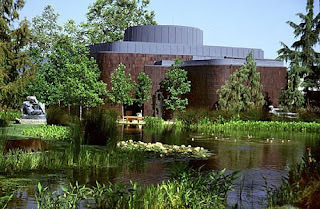 There is a darling painting by Vermeer on loan at the Norton right now, from the National Gallery in Washington, D.C....I can't wait to see this exhibit about Vermeer, which I guess will NOT be on a Tuesday!! "Blankets are okay, but they can slip and slide..."
I sacrifice comfort and warmth for style enough of the time! 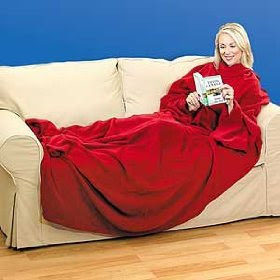 But when I'm at home, I am like a member of the AARP--I am always cold, I go to bed earlier than most of my friends, and I would totally wear a snuggie. In fact, I'm pretty sure I could rock this look. And if not...I'd still be warm and comfy. It was The Road, by Cormac McCarthy. A father and son trudge across an ashen American landscape in the wake of some unnamed apocalypse, fighting off sexually predatory bandits, scavenging for food, uncovering charnel-house horrors, then moving on, constantly moving on, toward some mirage of a better future. We don't need writers of Cormac McCarthy's caliber to inform us of looming planetary catastrophes; we can read the newspaper for that. 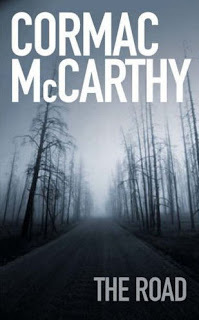 We need McCarthy to imagine the fate of the human soul if the worst really does come to pass; what he depicts in The Road is strange, awful, tender, and, in the end, surprising. Growing up, my family went on summer vacations together every year. Sometimes my Grandma Betty came with us, and when she did, I would always be “assigned” to share a bedroom with her. She snored like a bear, but I was the only person it didn’t bother. “That’s my other favorite word,” I said quickly. Kids always want to agree with someone who they think has a better opinion than they do, don’t they? But since then, blood and love really have been my favorite words. I never even realized until a few years ago just how connected those two words are. Whoa...wait a minute. Is that grammatically correct? Wouldn't it be, "the Lord has come?" Well, according to Grammar Girl, the phrase uses an archaic form of English that was used back in 1719 when Isaac Watts wrote the song "Joy to the World." In this instance, the word "come" is an unaccusative intransitive verb. (Yeah, I don't know what that means, either, but the point is that it's a form that's basically extinct in the English language.) It wasn't until the 1900s that people stopped speaking this way. Many Romance languages still use this verb form though; it's normal in languages like French and Italian to say the English equivalent of "He is come." And even though I think it sounds a little strange, I still think it's beautiful. Side note: While looking for a picture to post with this blog, I came across the coolest Christmas cards ever on someone's flickr account! 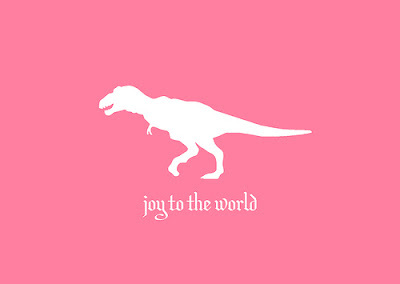 Christmas, pink, and dinosaurs, all combined. Genius. Here is my Christmas wish list...I only need four things (okay, maybe not 'need'). Well, I have a book list, too, but that will come later... A pretty passport holder. I will be using my passport next year and definitely want to travel in style. Note that this one is Tiffany blue, the best color ever. I am not a big TV watcher, at all. In fact, this really is the only show that I follow, but I haven't seen any of season 4 yet. Once I get this, I will probably disappear from the planet for a few days, watching the entire season in my room, alone and happy. I can't wait to watch this! 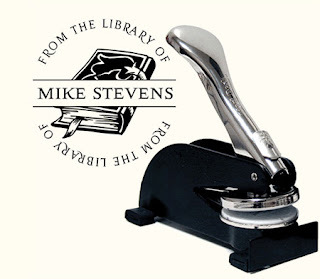 Now, I obviously don't want a book embosser with Mike Stevens' name on it. I'd like one with my initials. How cool are these? Seriously! I'd love to have one of these to stamp all my books. Every bibliophile needs one. So...what do you want for Christmas?? This weekend I thought about something. Something important. Something that I couldn’t shake. Something that was plaguing me. 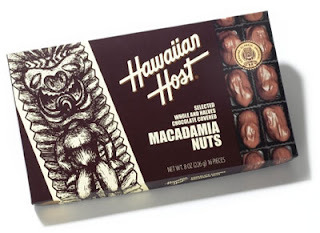 Why did a box of Hawaiian Host chocolate-covered macadamia nuts suddenly appear on our kitchen counter? Did it belong to someone? Was it a gift for someone? Would anyone care if I ate half of its incredibly delicious contents? Why was it unopened? Was it poison? If I tried opening it, would I suddenly be hanging by one foot upside-down from a rope? In the Birle house, there really is no explanation for an unopened box of chocolate. I don't get it.